Give away an adventure from Machirski Sport! 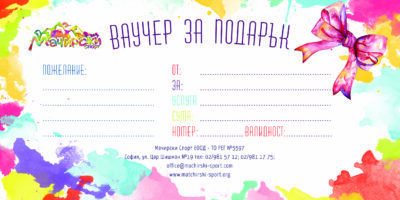 Choose a gift voucher from Machirski Sport! It is the perfect present for a good friend or someone close to your heart that will make them fall in love with nature and sport! Choose an adventure, that will leave behind a lifelong memories and many stories to tell. Give away a gift from Machirski Sport, choosing from: ski or snowboard course (length duration of choice), ski holiday, mountain hike in one of the 39 Bulgarian mountains, excursions in Bulgaria or abroad, paragliding flight with a red bull athlete, surf camps or one of many other adventures! A gift voucher from Machirski Sport is valid for one time only use of the selected service or other touristic service, offered by Machirski Sport Ltd. The voucher can be used for a different touristic service of the same or higher value (additional payment is required in case of higher valued services). In case of selecting a lower valued service, the price difference, is not refunded. Each voucher has a unique code and an expiry date. The voucher holder must use the service in the period of time before the expiry date. After the expiry date, the voucher becomes invalid. The voucher is personalized, but can be given away to a third person. The voucher can not be exchanged for its money value. You can not return a gift voucher once it’s purchased and it’s not returned if lost. In order to use your gift voucher you have to contact Machirski Sport in advance.